Do you ever look at your life and wonder how in the world you’re going to do what’s being asked of you? There aren’t enough hours in the day. There isn’t enough money in the bank. Distances are too far, hearts are too hard, and sometimes, our bodies just don’t work. In the past few weeks, Brett and I have been given some counsel from the Lord that looks impossible from our mortal perspective. I honestly can’t predict how this is going to work out, because for all intents and purposes, it can’t. We can’t do it. But the Lord has told us that’s what we’re supposed to do, so we’re trying to trust Him and move forward in faith. And as is so often the case, my personal gospel study has been full of enlightenment that ties directly to our current situation. The windows of Heaven have been thrown open so enthusiastically that as I tried to write this up, it quickly became apparent that it’s far too much for one post. Today, I’ll share the insights I was blessed with while studying the miracle of the loaves and fishes. You can read the second part about walking on water here. After Jesus learns that John the Baptist has been killed, He departs into the wilderness for some quiet reflection. But the people are so eager to be close to Him that as soon as they get wind of where He is, they rush out to meet Him. Christ is the perfect example of compassion even in the midst of His own sorrow, and He takes the time to heal them and teach them. 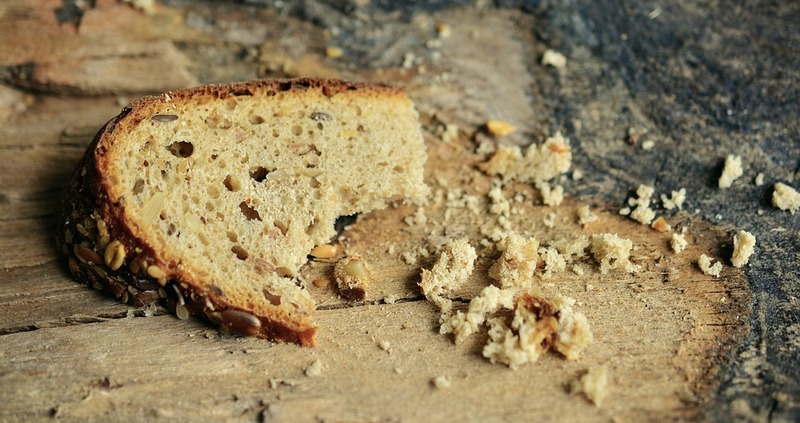 As the day progresses, Jesus’ disciples realize they’ve got a bit of an issue: they are surrounded by more than 5,000 hungry people, and all they have for food are the five barley loaves and two small fishes one young man brought with him. (Must have been a Boy Scout.) It is also too late and too far to run to the store to get food for everyone. In what I’m sure is a mounting sense of panic, the disciples come to Jesus and suggest that it might be time to send everyone home to get dinner for themselves. Christ tells them not to send the multitude away, but to bring the loaves and fishes to Him. He has the crowd sit down in companies on the grass, prays over the bread and fishes, and hands each of His disciples a small portion of food to distribute. Not only is there enough for everyone, there are also twelve baskets full of leftovers. This is one of the Savior’s best known miracles, and it paved the way for teaching the people that He is the Bread of Life. Whether we’re drowning in debt, praying for loved ones who have lost their faith, or battling an addiction, Christ has shown us the way to accomplish the apparently impossible. I truly believe that by following this pattern, we can learn for ourselves that with God, nothing is impossible. 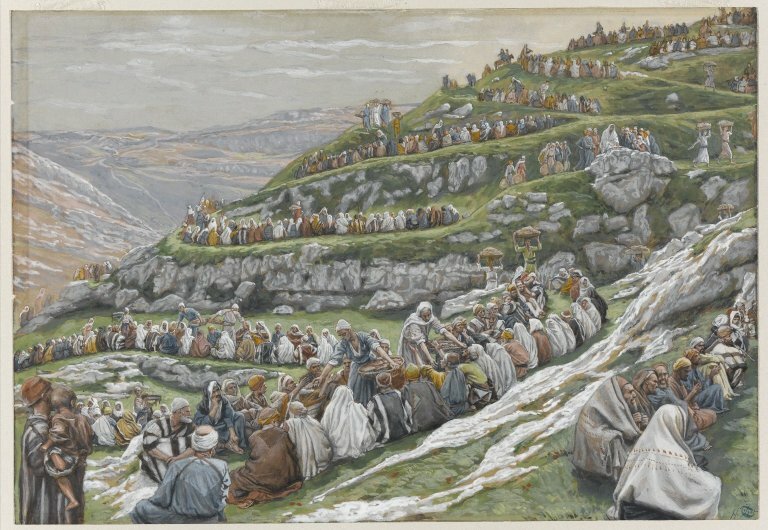 La multiplicité des pains (The Miracle of the Loaves and Fishes) by James Tissot. Public domain. Raise your hand if you see that pattern in yourself. I know I sure do. The Lord tells me to do something that’s going to stretch my faith a little bit, and my first reaction is to count off all the reasons why it’s not going to work. No wonder the Lord is always calling out His disciples for faithlessness. What would happen if we were more like Nephi, who, when faced with the task of building a boat, didn’t say, “But I don’t have any tools.” He said, “Where can I go to find the ore to make tools?” What if we stop trying to come up with excuses for why we can’t do something and start praying for the Lord to open our eyes to solutions we might not have considered? The Lord knows our needs before we do, and who’s to say He didn’t put the ore in the mountain just so Nephi could make those tools? Or prompt the boy to bring some bread and fish just so they would be available to feed the multitude? When we stop making excuses for why we can’t, it’s amazing how quickly the Lord shows us how we can. The trick is to be open to possibilities, and to remember that our mortal eyes don’t always see things the way God does. We see loaves and fishes, but God sees an opportunity to bless us and teach us. After gathering the loaves and fishes, Jesus prays. There’s much to be said for the power of prayer when you need a miracle in your life, but I want to focus on a specific quality of this prayer. Of all of the Gospel writers who describe this miracle, only John tells us that the nature of this prayer is one of gratitude. Five loaves and two small fishes doesn’t seem like much when you have a literal multitude to feed, but Christ still thanked His Father for what He had. As we express gratitude for the things the Lord has already blessed us with, we will learn to trust Him to provide any additional tools we might need to surmount our current obstacle. He has helped us before, and He will help us again. We don’t know many details about this next part of the miracle, so I may be taking some liberties here. 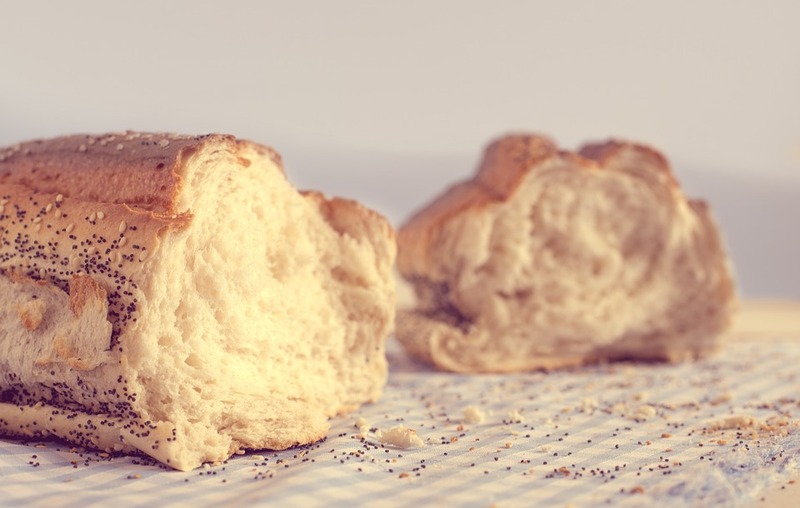 But based on how the Lord often works, I think it’s safe to say that Jesus probably didn’t hand each of His disciples a huge basket of bread before He sent them out into the crowd. I think it’s possible that they were each given a scrap—something that seemed impossibly small compared to the sea of hungry faces staring back at them—because they had to act on faith. They had to obey the Lord’s directions even though they couldn’t see how this could ever possibly work. Imagine their anxiety as they tore off a small piece and placed it in the first outstretched hand. Another hand, another piece. How long before they realized that their scraps of bread and fish didn’t seem to shrink despite the number of hands they had filled with food? How long before they recognize the miracle that they’re experiencing? Imagine them taking a morsel to feed themselves, too. How marvelous that miraculous loaf must have tasted. We rarely know how things are going to work out. We are here to be tried and tested, and what kind of test would it be if we had the answer sheet in front of us? Sometimes—no, usually—the Lord expects us to trust Him so completely that we are willing to take a step into the unknown when He asks us to. That kind of faith is strong enough to invite miracles into our lives. And boy, does it ever. We, like this multitude of hungry souls, will often find that the Lord didn’t just meet our needs, but He gives us even more than we asked for. Do we waste our miracles? When the Lord blesses us with more than we started with, what do we do with the excess? Do we go on a shopping spree? Do we hoard it? Or do we use it wisely, saving against future setbacks or sharing it with others who face needs of their own? Do we bear testimony of how the Lord has helped us, write it in our journals, and use it as an opportunity to teach our children how much God loves us? Or do we just say a quick prayer of thanks and forget about it? Just as we take stock of the things we have, it’s important to take stock of the miracles the Lord blesses us with, to be good stewards of the temporal means, the mended hearts, and the revelation God has given us. 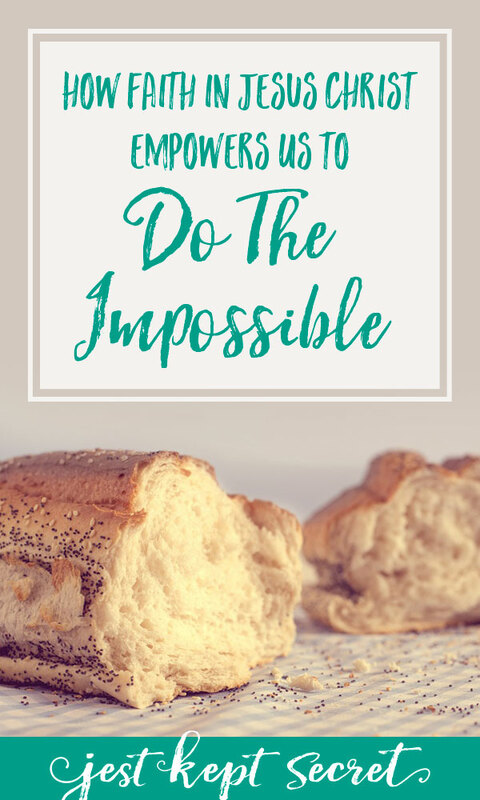 I love that the scripture doesn’t say, “Nothing is impossible to God.” It says, “with God nothing shall be impossible.” One of the greatest blessings God gives us in this life is the opportunity to work with Him, to follow His example, to learn from Him, and to be an active participant. Like the disciples distributing loaves and fishes to the multitude, we can have a front row seat to witness the Lord’s hand in our lives. The power is most undoubtedly His, but He wants to bless us. We are His children, and He loves us. He has so many miracles waiting for us, and He sent His Son to teach us how to invite His power into our lives to accomplish the impossible. I’d love to hear your story. Share in the comments below, or over on my Facebook page! If you know someone who would appreciate this post, please share it, and don’t forget to check out the second part here. Thank you! Featured Image by Free-Photos, used by permission. Bread crumbs photo by congerdesign, used by permission. Matt. 14:21 clarifies that it was 5,000 men plus women and children.